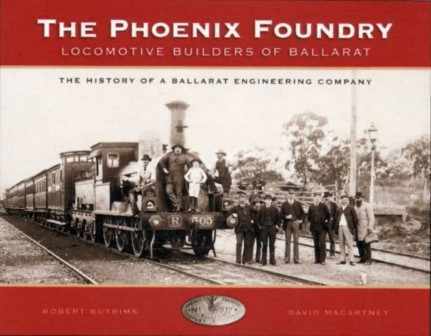 The Phoenix Foundry Company of Ballarat produced over 20 classes of locomotives from 1873 until 1905 and made 352 locomotives for the Victorian Railways. In full production it employed nearly 800 people. It commenced operations in 1856 and in its first years was one of the largest manufacturers of mining and othermachinery. Its first locomotive was delivered on 4th March 1873. The Phoenix Foundry was founded by ironfounder William Shaw, moulder Robert Holden, and enginesmiths Robert Carter and George Threlfell. The business prospered and by November 1861 employed 96 men producing a wide range of products. From around 1858 the employees were working eight hour days while doing as much work as Englishmen did in ten hours. In August 1871 the foundry successfully tendered for the first Victorian Government railway locomotive contracts, with the first one delivered on 27 February 1873, and by 1884 over 350 men were employed. Modernisation of the works was carried out after Shaw visited Britain in 1871 and 1885, becoming the most advanced workshops in the southern hemisphere. The hundredth locomotive was completed in April 1883, the two hundredth completed by October 1887. The majority of locomotives built were duplicates of imported 'pattern engines' designed and built overseas by other companies. Issues arose in 1889 when Shaw attempted to enforce a non-union shop resulting in conflict with employees. Further trouble arose the foundry's relationships with the Victorian Railways, with a tender war erupting between Phoenix and the VR Newport Workshops for the construction of the Dd class 4-6-0 light line locomotives. A Royal Commission was appointed in October 1904 to resolve the question of the 'real costs' of production. The Commission found in favour of Newport, who could produce a locomotive for �364 - some �7 cheaper than Phoenix's cost, and that Phoenix was making a 23 percent profit on each locomotive. Phoenix received no further orders beyond the seven members of the Dd class which were delivered in 1904. The works lasted another year until the directors entered voluntary liquidation. An excellent history of this Ballarat enterprise, well illustrated, and also contains follow up information on surviving locomotives and equipment.